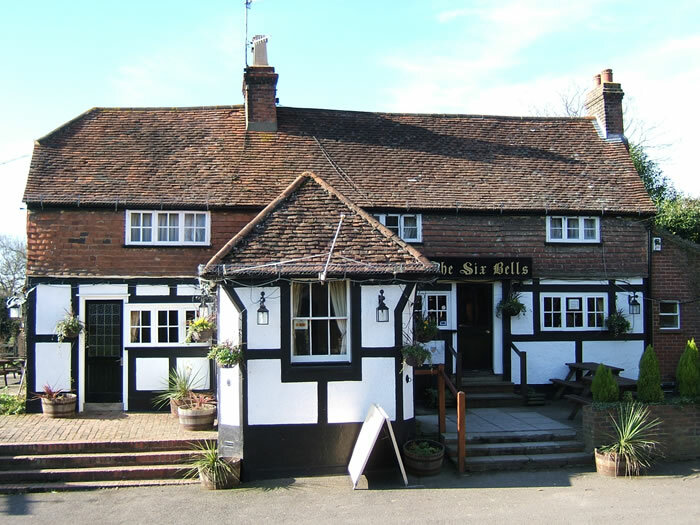 The Six Bells is a timber-framed pub with several interconnecting bar areas, with brick and wooden floors, on different levels and a larger restaurant area towards the rear. The pub was orginally called the Bells and subsequently the Five Bells but changed its name again when the church bells were recast in 1803 and six bells installed instead. Beers are from Hall and Woodhouse including Badger and Tanglefoot. Straight out of the pub, crossing the road, with the church on your left - cycle along a lane. Just before the road bends round to the left, turn right along a semi-private road. This leads on to a bridleway which cuts through to Charlwood. Return to Horsham via Lambs Green [try the Lamb Inn] and Faygate. or for a longer trip, come out of the pub, turn left and cycle north from Newdigate along country lanes via the Surrey Oaks towards Brockham. There is a nice village green at Brockham.